As a young boy, Dr. Jeff Cooney was fascinated by birds of prey and the freedom and power they represent. "I would walk around the meadow in Sunriver and lay down and watch them soar over my head," he recalls. The year he turned 12, Cooney met longtime local naturalist Jim Anderson. "He was so nice and took me under his wing." Before long, the boy was spending his free time at the Sunriver Nature Center, learning everything he could about raptors from Anderson. "Jim would take me out when he was climbing into nests of golden eagles to band them," Cooney says. "I became the little raptor boy." Eventually, Cooney was hired on by the Nature Center to help rehabilitate sick and injured birds. "In working with veterinarians, I found lack of knowledge with respect to birds of prey and wildlife in general," Cooney says. So he changed course, turning away from previous notions of being a high school biology teacher or an environmental lawyer, and decided to go to vet school. But he had one major hurdle. He couldn't handle the sight of blood. Cooney remembers watching a vet perform surgery on a goose that had been hit with a golf club. After passing out, he tore up his veterinary school application. But he couldn't stay away. "The next year I went back and watched surgery on bald eagle and that really turned me on," Cooney recalls. "I had to face my fear. I just put myself in a different state of mind." 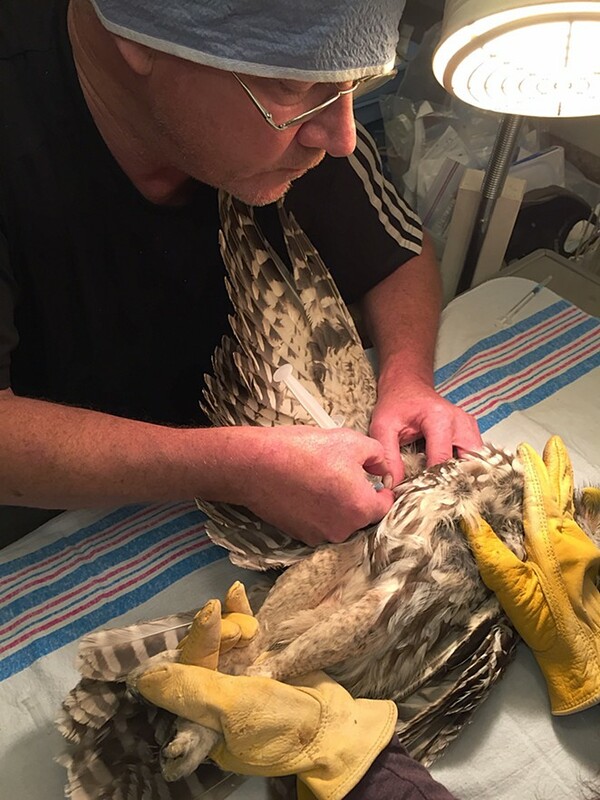 Despite his wooziness and discomfort with looking at or even talking about broken bones, he went on to do his residency in avian orthopedic surgery, fixing fractures on birds and training vets from all over the world at University of Minnesota's Raptor Center. "Then you get to the end of it and you have to find a job. Not a lot of people want to pay you to just take care of raptors," Cooney explains. "I came back here and started teaching at the college to fund my habit." Cooney has been getting his fix—healing injured raptors and other wildlife in Central Oregon—since 1995, working out of his own home and donated space at Bend Veterinary Clinic. It wasn't until last year that Cooney and his partner Jeannette Bonomo, who works as a veterinary technician, obtained a dedicated space and registered a name for their labor of love—High Desert Wildlife Rescue and Rehabilitation. "The goal is to eventually have a standalone hospital and education center, something Central Oregonians can be proud of, like the Raptor Center," Cooney says. "Our mission is to provide the best quality healthcare to wild and injured animals we can." Cooney, who recently retired, spends nearly every waking hour tending to wildlife in distress. And the demand is only increasing as more people become aware of the service he and his partner provide. "If you just look at say the last two years when we were doing it out of our home, we were seeing 100 or 200 animals [a year]," Cooney says. "Once we got the word out, and we did the slightest bit of promotion, we got calls from all over the place. We've seen more than 800 animals this year." HDWRR has a website, but the real action is on Facebook, where the couple regularly posts updates and photos of the wildlife coming being treated, often in the wee hours of the morning. They see everything from baby mice to deer, from humming birds to bald eagles. And even though spring is the busy season, on a recent Thursday afternoon Cooney had already received 15 calls and five new patients. They are brought in by everyone from concerned residents to veterinary clinics to the Deschutes County Sheriff's Office. "Now that people know where we are, they just show up on the front porch," Cooney says. "Sometimes we'll wake up in the morning and there's a bird in a box on the front porch or a baby bunny." He and Bonomo have been sleeping on the floor at the new building in order to provide overnight care for the animals. Baby mammals are especially needy, often requiring near constant feeding throughout the night. "These poor animals don't have owners, they don't have anyone to pay for their care," Cooney explains. "Human activity results in wildlife trauma and wildlife suffering. We have a debt to pay and someone needs to step up." At the moment, HDWRR's work is funded overwhelmingly by individual and in-kind donations. Now that the organization is registered as a nonprofit, Cooney says they will try to secure grant funding. But until then, he and his partner are eschewing salaries and making it work. "All these animals need care and we will provide it whether we get funds or not," Cooney says.